First, it receives the admission forms from the candidates, then it makes arrangements for the exams in the exams centers and sends the date sheet and roll number slips to the candidates. The regular and private candidates of Gujranwala Board for SSC and HSSC appear in the exams. 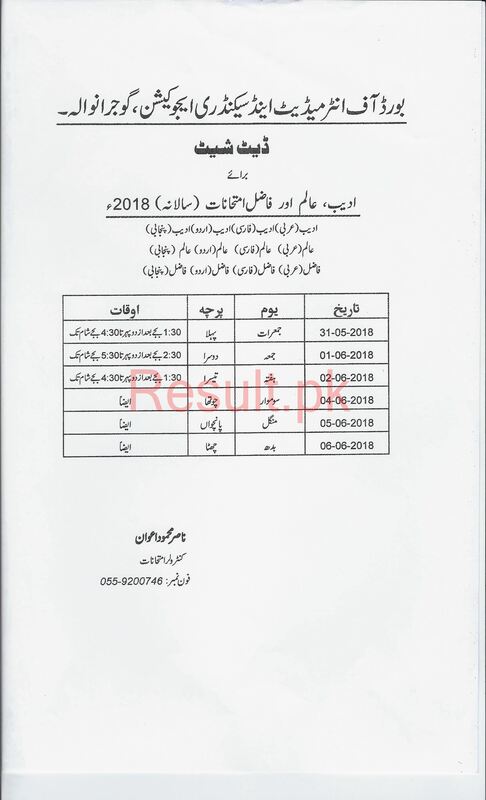 The date sheet of the Inter part 1 and 2 annual exams for 2018 2019 will be forwarded to the candidates on their homes in the month of April and the students appear in the annual exams of Intermediate part 1 and 2 for the year 2018 2019 during May 2018 2019. The students of FA/FSc part 1 and 2 for the annual exams of inter will be appeared in the annual exams at the scheduled time.